Smartphone Homescreen builder freeware for smartphone, Windows mobile phone free downloads. 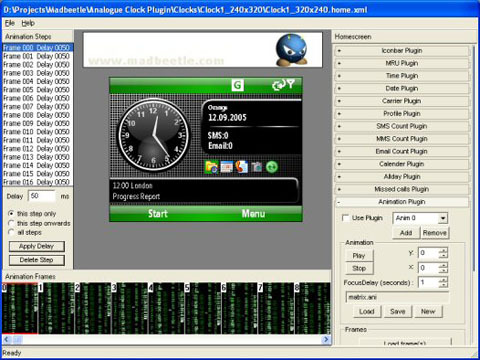 Note : Madbeetle extended plugins must be purchased for the target device. Editor suports the new Windows Mobile colour scheme. Gone are the 20 colours settings, now you simply choose the homescreen highlight, and drag the colour wheel to set the theme. Building a home is quick and easy. - Set the properties for each plugin. I keep getting the following message Error:CAB file"..." could not be created, what am I doing wrong? Thanks in advance. Fwiw, I can't get it to display properly on two Moto Qs. The picture is always blown up past the screen size, so you only see a part of the picture, that part is fuzzy, and much of the information and the mru are completely off the screen too. Anyone else have problems w/ a Q? This software has lots of problem if you are having IPAQ512 WiFi WM phone. It does not have the plugin for the WiFi connection. Besides, many of its own plugins will not properly in WM6 on IPAQ512 environment. why does it give you a cab file but only a xml file..
why doesnt it give you a cab file but only a xml file.. I think this is a great site . Great program! ...but now I want to learn XML code to really take this to the next level! Easy to use, many creative variables, SO much better than the T-Mobile Dash default screens. My only criticism: there are no instructions at all. But customer support was lightning fast in responding to my questions. I installed this and bought the programm for my phone, i made my background but what do i do next? how to i get it on my phone?????? does it work on samsung sgh-i617 blackjack II?